All major tax inventives and subsidies you need to be aware of when starting a business in France. The innovation tax credit in France (in French “Crédit d’Impôt Innovation” (C.I.I.)) is a tax measure that enables a partial funding of outlays incurred to enhance the functionnalities of any device on a given market; it can be in the form of a reimbursement or a reduction of corporate tax. International French group branch offices or subsidiary companies, provided thay are SME under the European definition, can obtain from the French state the reimbursement of up to 20% of their spending to embed new functionnalities on devices, in the same conditions as French companies. Branch offices are also concerned, that is to say, unincorporated foreign stable establishments in France. Because the innovation tax credit in France is a tax measure, it is not subjected to any regulatory framework and is not taken into account for the limit of European public fund aids. The spending engaged has to relate to the set up or conception of new prototypes or design of new products. Hence, a new product should meet a couple of criteria. First, it must not be made available to customers. Second, It outperforms technically those existing on the market. The costs of subcontracted research entrusted to public research entities, to scientific experts and private structures approved by the Ministry of Industry. The expenses are not capped! You must substrate all subsidies received from the expenses engaged. All staff costs not belonging to the company, provided they are charged at cost price, (prorated to the time spent on Innovation programs only). The depreciation allowance assigned to all Innovation programs are included in the base of calculation. Depreciation allowance benefits from an increase of 75% within operating costs. The innovation expenses entrusted to private organisms, which are listed and hence authorized by the Ministry of Indutsry’s Website. The subsidies related to the program must be susbtracted for the above mentionnned expenses. The maximium innovation tax credit you can get.. The tax credit will reduce corporate tax owed by the company. Any excess is refunded immediately. How to legally optimize and secure the Innovation tax credit (CII)? Companies that want to secure their CII in France can file a prior notice request (rescrit fiscal in French) to the tax authorities before starting research operations. This procedure is highly recommended. The opinion will constitute a position on the part of the tax authorities standpoint, although it keeps its right to control the reality and the amounts of the expenses eligible. The company has to submit evidence attesting the reality of their innovative programs. This submission takes the form of a write-up laid out according to the requirements of the Ministry of Industry. The status can be accumulated with all other tax incentives, especially the CICE, the CIR, the Video-Game tax credit and the Young Innovative Statut (JEI). For further information on this, please look up tax credits – what you need to know. 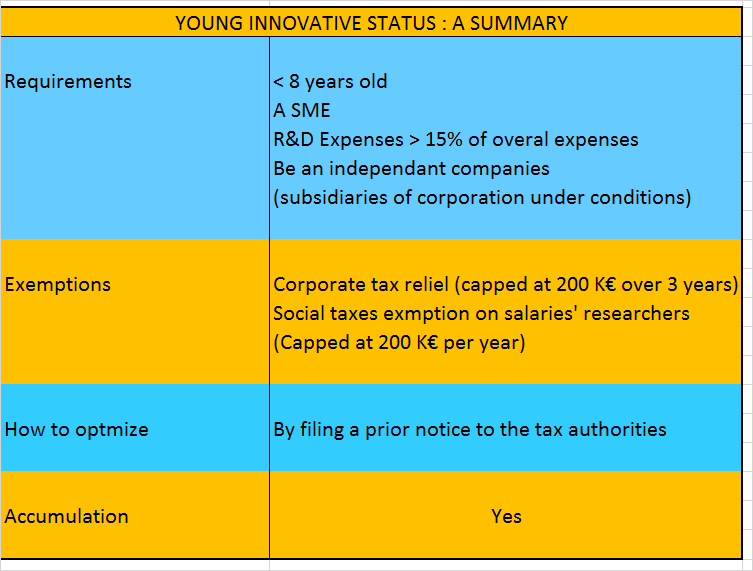 The innovation tax credit in France : to sum up..
Not only can the subsidiary of a foreign company acquire Young Innovative Enterprise but it can also accumulate it with the research tax credit under certains conditions. See the example below. An American company M, owned 40% by Mr. X and Mrs. Y, and 20% by a venture capital fund, has acquired at the beginning of 2018 company F in France. F has been founded beginning of 2016 and has a research center in France and filed for Young Innovative Status. M, which has no other subsidiary than F, has declared for the fiscal year closed on December 31, 2018 a (euro equivalent) 35 M€ turnover, with 120 employees. F declared a 2 M€ turnover, with 23 employees, 1.25 M€ of gross salaries, of which 0.35 M€ of personnel costs for research operations, social taxes (@ 42% before any exemptions) and a 0.083 M€ of corporate tax. The company did not file for either the CIR or the JEI status at the end of 2016. What grant aid can the company still benefit from for the 2018 calendar year ? If possible, how much can the aids be? R&D expenses represent 843 K€ (405+158 x 1,50), which is far above the threshold of 15% of the total charges. 2) It can also benefit from the research tax credit (CIR over the year 2018 as well). this is the first time the company records a pre-tax profit. 3) All in all it can save 381 K€ !! To signicantly decrease the cost if labor on medium & low wages and and allow Corporate France to garner again market shares worldwide, the French gouvernment enacted in 2012 the CICE tax credit. Who can benefit from the CICE tax credit? 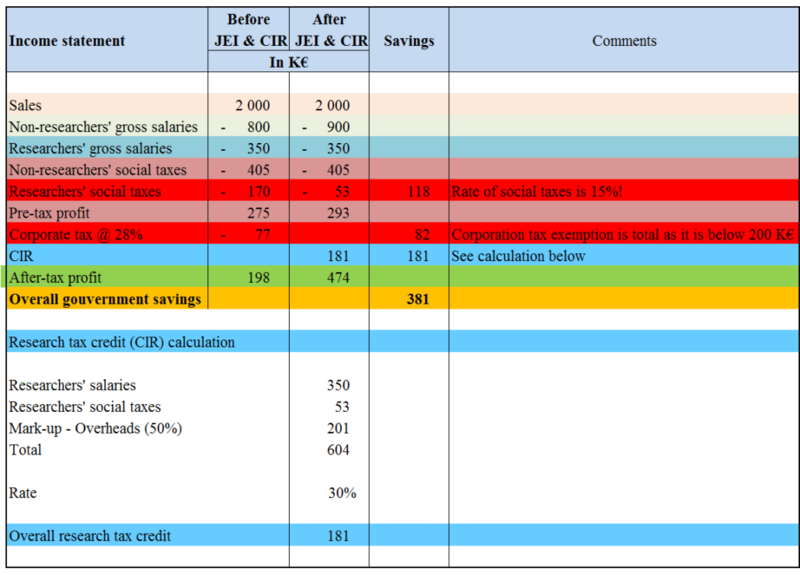 And how does the CICE tax credit work ? The CICE can be claimed for all salaries which are 2.5 lower than the French minimum wage (SMIC). If the wage is higher than 2.5 SMIC, the branch or subsidiary cannot claim any CICE tax credit at all. For a employee paid all over the 2018 calendar year on a fulltime basis (that is 1 820 legal work hours), this means the wage must not overtake 44 940 €. If a entity employed a person less than one year and/or on a part-time basis, it needs to adjust the threshold accordingly. For instance, if a company clerk employed 50% of the legal duration of work over one calendar month, its needs to compare his or her pay to 1 872.50 € (44 940/12*50 %) to ensure whether his salary is eligible to the CICE tax credit. The rate is 6% for salaries paid over the current calendar year. Hence, the maximum tax credit the company can claim per employee over 2018 amounts to 2 696 € (44 940*7%). The tax credit can be applied to the tax bill of the year. The excess of CICE tax credit over the tax bill is immediately refundable if the entity (together with the parent company and sister company) is considered as a SME. Otherwise, it has a 3-year carryforward. After this 3-year period, it becomes refundable. If the fiscal year of the company differs from the calendar year, the entity can claim a refund only for the past calendar year. For instance, a subsidiary whose fiscal year ends as of 10/31/2017, can claim the CICE tax credit for salaries paid over 2016 only. It has to wait for the 10/31/2018 close to claim that of the 2017 calendar year. Given the fact it is a non-taxable profit, its ecominical effect overtakes 6%. Assuming a standard tax rate of taxation (33/1/3% in 2018), its actual relief amounts to 9% of the gross salary, or 6.4/% over the overall cost of labor. Tax credits in France can be likened to subsidies granted by the French Government. They are aimed at dicreasing most of the time the overall cost of labor signicantly when they can be combined to each other (up to 50%). Tax credits in France – How does it work in brief? First, applying for them assumes the entity pays corporate tax in France. Practically, branches and companies can claim tax credits. Liaison offices cannot claim them as they do not pay income tax in France. Second, and as a result of the first paragraph, they often are calculated partially or even totally on gross salaries. Third, they are never subject to corporate tax. Indeed, they are always deducted from the taxable profit. This feature makes them totally different from all other grants and subsidies. Prize-winning awards, subsidies and loans (whey they are not refundable any longer for certain conditions) are always included in the basis of calculation of the corporate tax. Finally, they are deducted from the tax bill any company has to pay each year. The excess of tax credits over the tax bill is either repaid immediately or maximum after 3 years, if the company has not been in a position to apply it to tax bills after this 3-year period. The terms of refund hinges either (i) on its size (a SME or not) and/or the type of tax credit. Possible combination of tax credits? The tax credits that are worthwhile to apply for can be added to each other with no restrictions. In other words, a company does not have to choose between certain tax credits. Taxonomy of tax credits in France. 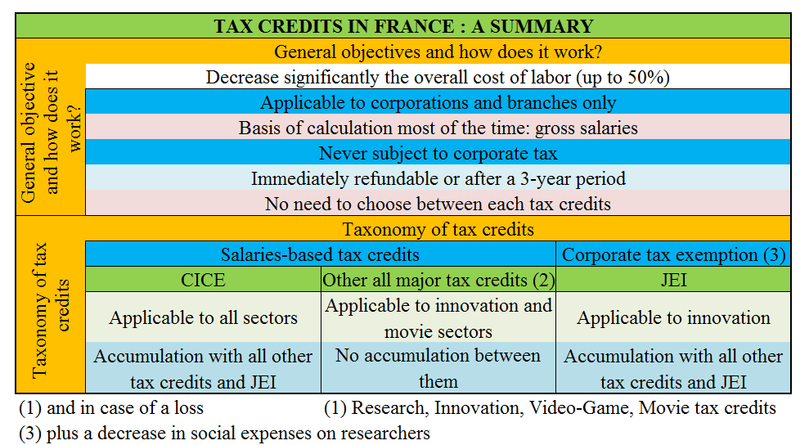 There are on one hand the competitiveness and employment tax credit (in French CICE) and on the other hand all other major tax credits (Research, Innovation and video-games andx tax credits). The CICE can be applied by all companies, whereas the second group finances specific sectors, especially the high tec one. As a result, the same € of gross salary can give rise to both CICE and all other major tax credits. Conversely, this situation never applies among all these latters. For instance, the same € of gross salary spent to get to the research tax credit cannot finance the video-games tax credit (and vice-versa). The Young Innovative Enterprise Status (JEI) has a particular status. Indeed, it combines a corporate tax exemption over 24 months and a decrease in 2/3 of the social expenses on researchers’ salaries. It can be applied by SME whose seniority is lower than 8 years. The JEI status is always accumulated all other tax credit especially with the research tax credit. The corporate tax exemption (not the social advantage) is capped to 200 000 €. In the Parisian region (IDF: Ile de France in French), International groups wishing to start a business in France, in particular an innovative one, can profit from 4 financial support programs, two of which are national. There are regional financial support programs in other regions comparable to those existing in the Parisian region. Which criteria should be met to apply to these programs? Depending on the program, the parent company (together with all its existing subsidiaries) shall be considered by the European legislation as either a medium-sized business (Turn-over and balance sheet< 43 Millions €, Staff members <250), or a small business (turn-over and balance-sheet <10 Millions €, staff members < 50). Most of the time, the seniority of the newly founded subsidiary is not always required. The only exception is the PIA programm which is dedicated to start-up companies. Finaly, the subsidairy has to operate preferably in a forward-looking sector. However for some grants, it is not a prerequisite provided the subsidiary has ambitious projects in France. How much can these subsidies in France finance innovation? They can fund up to 70% of research programs [internal or exterior] intangible expenses, with a ceiling from 25 to 80k€ when granted in the form of subsidies and sometimes more when granted in the form of reimbursable advances. If these research programs are collaborative (i.e. they are managed by several companies), financial support can be even more substantial (several millions Euros). As opposed to the subsidy [which is in principle definitively granted to the company] the financial support is reimbursable if the financed program is a commercial success. In such a case, the reimbursement is always interest free. These grants can be accumulated with prize-winning award such as the Worlwide Innovation Challenge (WIC), loans for innovation, and fiscal support for innovation, whether the company is eligible to the Research and Development Tax Credit (C.I.R: Crédit d’Impôt Recherche in French) or the Young Innovating Company status (JEI: Jeune Entreprise Innovante in French). WHAT ARE THE CONDITIONS TO GET THESE SUBSIDIES ? Employment subsidies in France can also be substantial, especially if the subsidiary or the branch belongs to a group considered as a Small or Medium Enterprise (SME) under the European definition and develops one or several technological innovation (such as biotechnology, heavy metal recycling, marine resources valorization, vegetable protein and vegetal chemistry, individualized medicine, silver economy, big data operation valorization, etc.) : in general any recruitment can be eligible to government support. Foreign group’s liaison offices can benefit from employment subsidiaries under the same conditions than French group’s subsidiaries or French capital owned companies. These employment subsidies can be accumulated with the tax incentives such as the research tax credit (CIR) or the statut JEI (Young Innovative Status). WHAT ARE THE MOST INTERESTING EMPLOYMENT SUBSIDIES IN FRANCE AVALAIBLE TO COMPANIES? PM’Up is the most attractive for executive staff recruitment because the employment subsidy can be drawn over a three year period and sum up to a total of 250 k€. Non executive recruitment also can benefit either from employment subsidies or from a financial support. Moreover this subsidy allows the recipient to have access to over 1000 parners and world-class corpoprations. Finally, the company benefits from the help for free of a counsellor over the aforementionned period. Unlike PM’UP, which is aimed at financing innovation, employment subsidies in France target a wide range of fields of activity, most of which are industrial. The recipient can acquire either a subsidy or a loan. Of course, should the support be a loan, it is interest-free and can sum up to 20 K€, that is three times as much as the maximum amount for a subvention (7 K€). From the instance a foreign group is considered as an Small or Medium Enterprise (SME) under the European definition and that their French branch or subsidiary develops an innovating technology, it can benefit from the following favorable term loans: first of all, loans can reach a high equivalent of the net equity and comparable funds (between 1 and 2). Moreover, the first reimbursement is deferred for at least 2 years and no guaranty is required. Lastly, the can be accumulated with employment subsidies, the research tax credit (CIR in France) and/or the statut JEI (Young Innovative Status). WHAT ARE THE MOST INTERESTING TYPES OF LOAN TO INNOVATION A COMPANY CAN GET? The first most interesting mechanism to apply to during the creation stage of the subsidiary is the seed loan (PPA: Prêt Pour l’Amorçage in French). To benefit from it, the entity has to initiate an R&D program and the group must have less than 5 years of existence. The loan ranges from 50 to 150k€ (but capped at the amount of net equity) over a 7-year period with a 36-month deferral for payback. Subsequently, the loan for innovation (PPI: Prêt Pour l’Innovation in French) is by far the most interesting. To benefit from it, the group must have more than 3 years of existence and the subsidiary has to manufacture and sell an innovating technology. This loan can reach up to 3 M€ by 12 months periods and be equivalent to twice the amount of net equity (in other words, a subsidiary with a 1.5 M€ net equity can benefit from the maximum). The loan is based on a 7-year period with a 24-month deferral for payback. Context: France is proud of its heritage and is determined to spread it worldwide although they already are the number one touristic destination in the world. Films and other fictions play a substantial part in this promotion. That is why the Ministry of Culture has set up important tax incentives for film producers, which are even more attractive for foreign companies. The conditions to obtain a refund are (1) an agreement from the Centre National du Cinéma (2) the majority of the movie/episode has to be shot in French. In practice, the agreement is needed prior the launching of the French movie performance. Moreover, the tax credit cannot cause all subsidies to overtake 50% of the overall budget. The tax credit is calculated per episode or movie and represents up to 30% of the aforementioned costs, which means the movie tax credit is capped at 9 M€ accordingly. If the tax credit has not dedudted from the tax bill, it is immediately refunded. The conditions and the calculation of this tax credit (in French Crédit d’impôt pour production de films et ouvres audiovisuelles étrangers) are the same (agreement of the CNC, expenses capped at 30 M€, etc.) at the exception (1) that the movie/episode is required to highlight parts of the French heritage, but is not required to be shot in French. Hence, the movie tax credit is capped at 9 M€ accordingly. You are video game editor and you wish to implant yourself in Europe? Consider France, along with its skilled labor in this sector. Indeed, there is a very an interesting tax incentive in France for this activity. The Video Game Tax Credit (CIJV: Crédit d’Impôt Jeux Vidéo in French) targets any branch or subsidiary owned by a company subjected to corporate tax that creates video games and meets some criteria: the company must in particular acquire an agreement from the Centre National du Cinéma. How much can a company get a from this tax incentive in France? In practice, any essential costs required to produce the video game are eligible for this tax credit: personnel costs affected to the creation of the game, copyright, subcontracting (capped at 2M€, materiel depreciation assigned to the creation of the aforementioned games, etc.). You must substract from expenses all innovation subsidies related to this tax credit. Eligible expenses are capped at 15M€ per calendar year. It enables a 30% tax reduction. In other words, the tax credit is capped at 4.5 M€ per calendar year. This tax incentive in France reduces income taxes owed by the company. The excess of this tax incentive in France over corporate tax is immediately refunded in cash. Possible accumulation with other tax incentive in France? Any company that profits from this tax credit can also benefit from the CICE, Research Tax Credit (CIR: Crédit d’Impôt Recherche in French) or the Young Innovative Company status (JEI: Jeune entreprise Innovante in French) as well. The research tax credit in France (in French “Crédit d’Impôt Recherche” (C.I.R.)) is a tax measure that enables a partial funding of research, development and experimentation (R&D) for companies; it can be in the form of a reimbursement or a reduction of corporate tax. International French group branch offices or subsidiary companies can obtain from the French state the reimbursement of up to 30% of their spending on research, experimentation and development operated in France, in the same conditions as French companies. Branch offices are also concerned, that is to say, unincorporated foreign stable establishments in France. Because the research tax credit in France is a tax measure, it is not subjected to any regulatory framework and is not taken into account for the limit of European public fund aids. The spending engaged has to present non-controllable technical risks and allow an increase of knowledge in the considered technical domain. The costs of subcontracted research entrusted to public research entities, to scientific experts and private structures approved by the Ministry of Research. All staff costs not belonging to the company, provided they are charged at cost price, (prorated to the time spent on R&D operations only). The depreciation allowance assigned to all R&D operations are included in the base of calcultation. The research expenses entrusted to private organisms are limited up to twice the total amount of other eligible expenses, and capped either (i) to 10 M€ per company provided it is independent on the subcontracter, (ii) to 2 M€ otherwise. The listed of authorized subscontracted can be looked up on the Ministry of Research’s Website. The fees incurred to protect and maintain patents up to 60 000 €. All external outlays up to 60 000 €. Note that staff’s costs are not taken into account. The tax credit will reduce corporate tax owed by the company. Any excess is refunded immediately if the company is considered as a SME under the European’s Union definition. Otherwise, it will have a 3-year carryforward. At the end of 3, years, it becomes refundable in cash. How to legally optimize and secure the research tax credit (CIR)? Companies that want to secure their CIR in France can file a prior notice request (rescrit fiscal in French) to the tax authorities before starting research operations. This procedure is highly recommended. The opinion will constitute a position on the part of the tax authorities standpoint, although it keeps its right to control the reality and the amounts of the expenses eligible. The company has to submit evidence attesting the reality of R&D operations. This submission takes the form of a write-up laid out according to the requirements of the Ministry of Research. The status can be accumulated with all other tax incentives, especially the CICE, the Video-Game tax credit and the Young Innovative Statut (JEI). For further information on this, please look up tax credits – what you need to know. Assuming the gross salary of a researcher is 100 € (145 € all social expenses included), the subsidy amounts to (145*1.5)*30%=65.25 €. The research tax credit stands for up to 45% of the overall cost of a researcher. Accumulated with the tax reduction entailed by the expenses, (145/3)=48 €, the overall tax credit amounts to 65.25+48 = 113 €. Hence, the residual cost born by the company amounts to 148-113 € = 35 €, that is 24% of the overall costs! The research tax credit in France : to sum up..
Assistance in case of tax authorities claim or control.